PokerStars Mobile for Android, iPhone, iPad, Play for Real Money! PokerStars Mobile is now available worldwide. The PokerStars brand reputation for quality and trustworthiness is shown through the brilliance of it’s mobile app and poker players are proclaiming the benefits of being able to play PokerStars where ever they may be! The easiest solution is to click the AppStore button below to visit the PokerStars App on iTunes, Alternatively you can search for PokerStars in the App Store. Within a few clicks you will have the mobile app installed and ready to play. The instructions are very similar for your Android device. 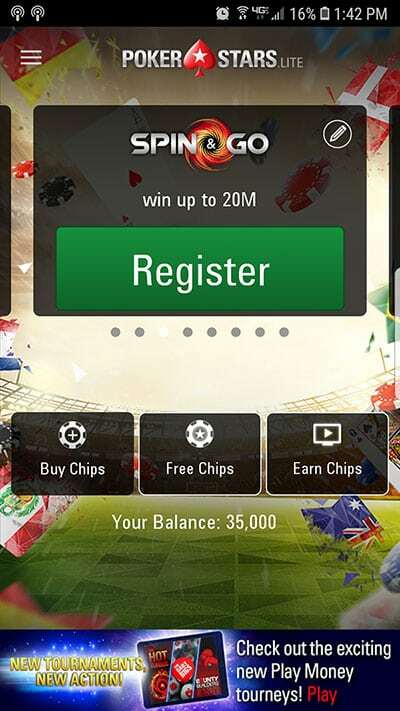 Again, the easiest way is to click the Android button below or visit the Market App on your Droid device, search for PokerStars, and download the mobile app directly onto your phone. Estimated data usage is 10K download and 5K upload per minute. These amounts may vary based on the speed of the game. In other words, if you are playing one table for an hour you will use approximately 1MB download and 500KB upload. If you have a restrictive data plan you may want to upgrade before you begin playing or always make sure you’re connected to Wifi. You can create a new account directly through the mobile app. 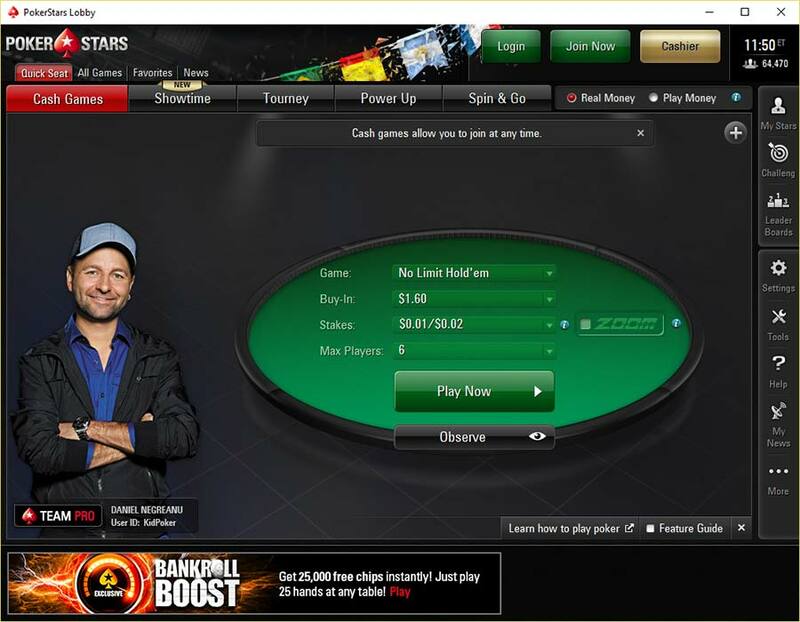 If you already have a PokerStars account, you can skip this step. A new window will open where you will have to enter your new username, password and e-mail address. Next, you will be asked how you heard of PokerStars. In this menu select “Marketing Code (if available)” from the drop down and enter FlopTurnRiver. This will ensure you receive the full bonus offer and exclusive offers for FTR players. You will receive an e-mail with the verification and once your e-mail has been verified you ready to start playing on PokerStars Mobile! To deposit money into your account through the PokerStars Mobile client, press the cashier button at the bottom of the screen. There are many deposit options for you to choose from and these will vary based on your location. Once you have chosen your preferred deposit method, fill out all the necessary information to proceed with the deposit. When making your deposit, don’t forget the PokerStars bonus code STARS600! This will activate your 100% up to $600 deposit bonus, described below. All new players who make their first deposit through the PokerStars mobile app will receive a 100% match up to $600. To activate this bonus make sure to follow the deposit instructions above and enter the PokerStars bonus code STARS600. To clear this bonus, you must play real money games and collect VPPs. Each $1 of the bonus takes 20 VPPs, so the full $600 bonus will be fully cleared once you collect 12,000 VPPs. The bonus will be released in increments of $10, meaning every time you earn 200 VPPs, $10 will be deposited into your account. If tournaments are your game, you will earn 5.5 VPPs for every $1 in tournament rake. Entering a $50 + $5 tournament will net you 5 x 5.5 = 27.5 VPPs. Cash games are a bit more complicated, but ultimately comes down to your contributed rake. Every $1 in rake you contribute to a pot earns you 5.5 VPPs. If you’re playing a $.50 – $1 cash game with 4 players who each contributed $25 to the pot, the rake would be $3 for a total of 16.5 VPPs. Since everyone contributed equally, these VPPs would be split evenly, 16.5 / 4 = 4.125 VPPs for each player. The $600 bonus is only for players making their first deposit and must be cleared within 120 days. Any bonus remaining after 120 days becomes invalid. After you have created an account and installed the app on your portable device, simply click the app, log in using your user name and password, and then you can start playing instantly. A wide variety of stakes are available in the lobby, ranging from low ($2 NL) to high ($5k HU SnG’s). Games varieties include Hold’em (No Limit, Limit, or Pot Limit), and Omaha (Limit, Pot Limit, Eight or Better). If you can’t be bothered going through all the different games, the ‘Play Now’ button will have you in the action right away. The interface itself is clean, welcoming, and easy to use, even for first-time players. Relative to the screen size, the buttons are big, responsive, and colorful, and the information, such as chip counts, and cards, are easy to see. On the iPad, the action is quick, the buttons are large, and it is very easy to switch between tables. On the other hand, play on an iPhone can be uncomfortable at times due to the small screen size. The possibility of a miss-click is always there, and this could potentially be a huge problem during play. That being said, the action remains fluid and lag-free on either device. 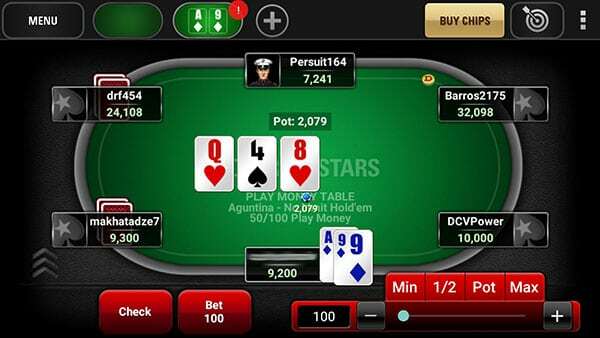 The app restricts multi-table play up to four tables on a phone, and five tables on the iPad. 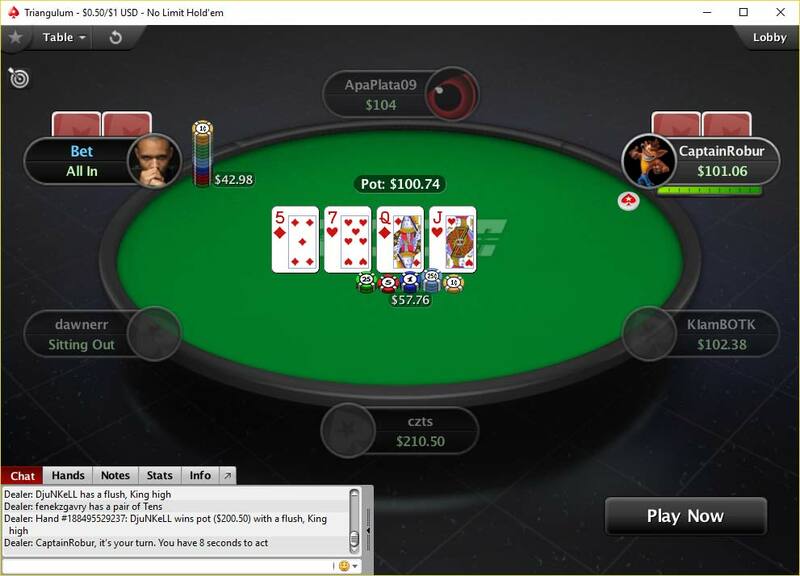 For a player focusing on one table or a few tables this is not a problem, however players used to heavy multi-tabling are better suited playing on home computers. One thing to consider while playing is the strength of your Internet connection. If a player disconnects in the middle of the hand they are given 90 seconds to connect before their hand is folded. It is strongly suggested to use a WiFi connection over your 3G-phone network. Taking everything under consideration, the PokerStars Mobile App is a fun and exciting way to play poker in the palm of your hand. 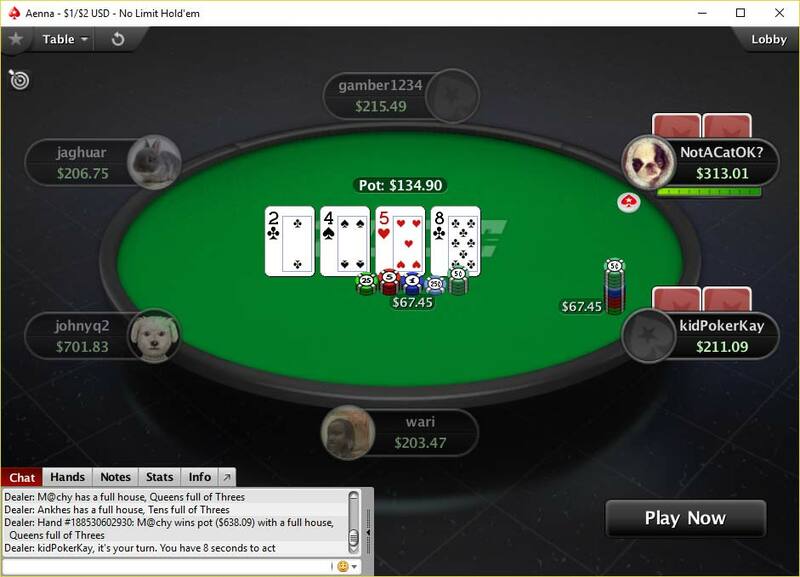 It should not be your primary way to access your PokerStars account, but if you are looking to play poker on the go or on a handheld device, the PokerStars Mobile App is absolute aces. 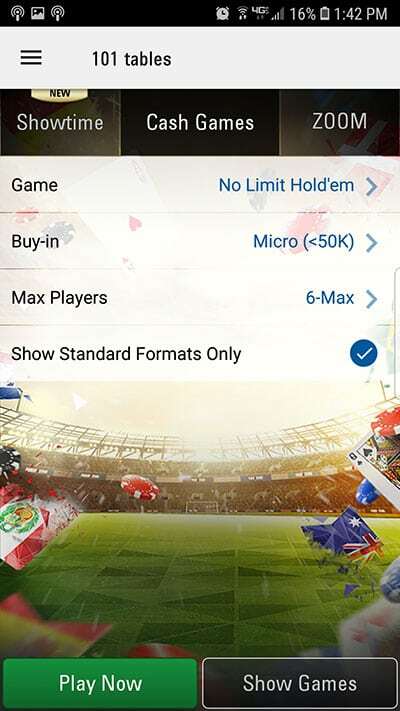 The PokerStars mobile app is available in the following languages: English, Dutch, German, Spanish, French, Italian, Polish, Russian, Romanian, Slovenian, Finnish, Swedish, Danish, Estonian, Portuguese. PokerStars Zoom Mobile is undoubtedly the best fast–fold poker app on the market. Once you try it out and compare it to the PC/MAC software, you will quickly notice that it has virtually the same level of comfort on a smartphone or tablet. 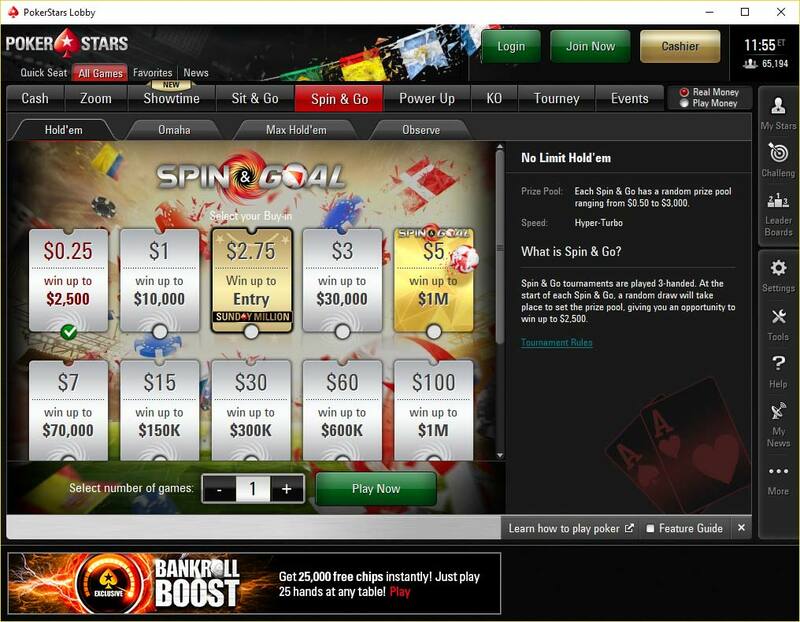 Zoom poker has a separate lobby where you can use filters to choose your favorite game. Once you decide to join a game, all you have to do is bring some money to the tables and you are ready to go! The fast fold button is big and clearly visible and the tables rarely experience any lag, except for when the issue is your internet connection, so be sure to check you connection before you zoom off to those huge pots! Don’t wait any longer, it’s time to download & install the PokerStars mobile app! Within minutes, you can be playing poker for real money on your daily commute, when waiting in line, or when relaxing on your couch!